A tile is a manufactured piece of hard-wearing material such as ceramic, clay, stone, porcelain or even glass. Tiles are often used to form wall and floor coverings, and can range from simple square tiles to complex mosaics. Tiles are most often made from ceramic, with a hard glaze finish, but other materials are also commonly used, such as glass, slate, and reformed ceramic slurry, which is cast in a mould and fired. Karpet Kare offers a wide variety of natural, manufactured, and Island made custom tiles. We also always have in-stock white matte and gloss finish tiles for last minute projects. Long Lasting: Ceramic, when installed and maintained properly, will last for the life of your home. Low Maintenance: Ceramic cleans easily with a neutral floor cleaner. Virtually Unlimited Designs: Ceramic offers a wide variety of looks, colors and patterns. Stands Up to High Traffic: Extremely durable ceramic is an excellent choice for high traffic areas. Great Investment: Although ceramic is harder to install than other flooring, it is an investment that pays off, increasing the value of your home. Difficult to Install: Professional installation is highly recommended, and can be expensive. May Chip or Crack: Ceramic's hardness makes it susceptible to chipping or cracking from impact. Hard, Unforgiving Surface: Ceramic is not easy on breakable objects or muscles and joints. Plates and glass may break; knees and elbows may bruise from falls, and standing on a very hard floor can cause muscle fatigue. Colder Perception: Ceramic may feel cooler to the touch than other floor types, in low-temperature environments. Ceramic tile: Made from clay or a mixture of organic materials, ceramic tile is finished by kiln firing. The common types are mosaic and quarry. Made in many shapes and sizes, it is glazed or unglazed. For floors, it is set in a cement or mortar type mixture. Glazed tile: Clay shaped into tiles, fire-hardened, then covered with a matte, glossy glaze or sealant to make the tiles more resistant to moisture. Quarry tile: Glazed or unglazed ceramic tile made of natural clay and shale using an extrusion process. Usaully in terracotta colored squares. Terra-cotta tile: A sundried clay based tile. Defined by its reddich earth color tones and is usually made in Mexico. This is a non-fired product and very breakable. Slate: A naturally laminated rock that is often used in regular and irregular shapes embedded in cement or mortar to create a hard-surface, patterned floor. Naturally abrasive. Marble: Limestone flooring known for its elegant appearance created by polishing its very hard surface. Most often available now in tiles. • Have a surface that provides color, design and ease of maintenance. • The higher the firing temperature, the harder the glaze. • Light-colored glazes tend to be stronger than dark ones. • Shiny glazes tend to be softer than matte or satin finishes. • Offer a greater range of colors. • Are more resistant to stains. 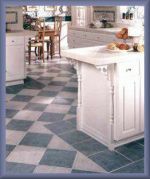 • Have a color produced from the tile's composition and/or added pigments. • Tend to stand up better to wear. • Their natural surface makes them more slip-retardant.